Dr. Jason Kanarish graduated from the University of Illinois in 1995 where he received a Bachelor of Science in finance. After initially working in the finance industry, he decided to change careers and pursue his lifelong dream of becoming a veterinarian. He returned to the University of Illinois where he entered the College of Veterinary Medicine and completed his Doctorate of Veterinary Medicine in 2003. After working at a prestigious animal hospital in downtown Chicago, and spending his entire life managing the cold winters of the Midwest, Dr. Kanarish decided to move with his family to sunny Arizona, where he worked for many years at Dreaming Summit Animal Hospital in Litchfield Park. 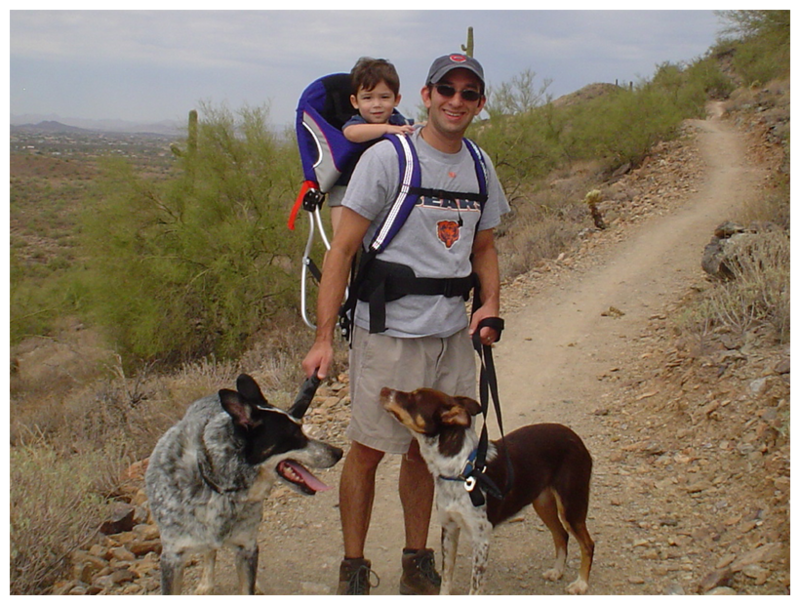 With over 14 years of experience working in veterinary medicine, Dr Kanarish opened Phoenix Mountain Animal Hospital where he continues his passion for treating pets. Dr. Kanarish’s areas of special interest include internal medicine, soft tissue surgery and dermatology. Dr. Kanarish treats with a comprehensive style, not only caring for the animals themselves, but also establishing close relationships with the pet owners. He particularly enjoys witnessing the bond that we share with our pets and is a strong believer in educating and empowering pet owners so they can provide the highest level of care and be their pet’s best advocate. In his free time, he enjoys hiking, swimming, music and spending quality time with his wife Lisa and young sons Charlie and Sam. He is an avid supporter of rescuing animals and currently has three pets: Indie & Friday the dogs and Nya the cat. Lisa is the office manager at Phoenix Mountain Animal Hospital. 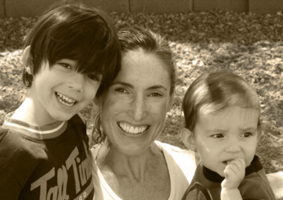 When she is not at work, she enjoys spending time with her two sons and the family pets. She graduated from the University of Michigan and studied at Loyola University Chicago Law School. 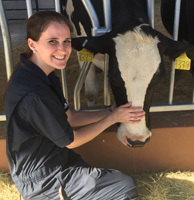 Monica, our certified veterinary technician, is a graduate of Mesa Community College Veterinary Technology Program who joined our team as an intern in 2013. She also attended Arizona State University where she obtained her Bachelor’s in Psychology. She volunteers at Home Fur Good Rescue and fosters kittens and cats, but also shares her home with her own feline children: Louie, Theodore, Percy and Thumbs. On her free time, she enjoys yoga, hiking and rock climbing. 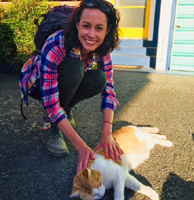 Courtney started as a veterinary technician in May 2015. After obtaining her Bachelors in Biology from ASU, she enrolled at Midwestern University with the ultimate goal to become a veterinarian. She is interested in learning more about large animal medicine. She enjoys hiking, horseback riding, and camping. Courtney adopted both her pets, Maggie the cat and Kirby the cattle dog. 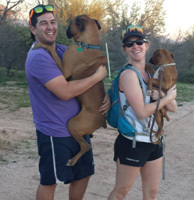 Mitch is a veterinary technician who started working with Phoenix Mountain Animal Hospital in Spring 2017. He has a bachelor’s degree in biochemistry and began his veterinary career in 2008. He has two pets of his own at home with his wife: 2 boxers named Waffles & Hashbrown. On his free time he likes to go hiking, fly fishing and camping. 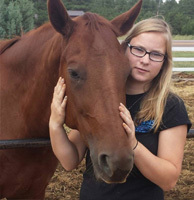 Mara joined Phoenix Mountain Animal Hospital in spring of 2017 to care for our boarders and work as a veterinary assistant. Mara started working with animals in her mom's grooming shop in 2010 and interned at her first clinic while taking a vet course in 2013. 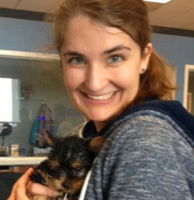 She has worked at various animal hospitals between Texas and Arizona. If she isn't working, you may spy her cycling around Phoenix, hiking a mountain, or swimming laps in a pool. At home, she has 3 pets she adopted: Roman (Chihuahua), Piper (cat) and Oscar (beta fish). Tierney joined the PMAH team in February of 2018 as an office coordinator. 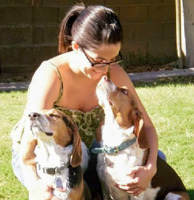 She has worked in the veterinary field since 2011 and has experience in all aspects of the field. She is currently enrolled in Penn Foster Veterinary Technician program working her way towards her veterinary technician degree. She shares her home with her two dogs: Utah and Sedona. Tierney loves all things Disney and enjoys reading & watching movies. Jen actually started at Phoenix Mountain as a veterinary assistant in 2016 but couldn’t stay away and came back to work here summer of 2018. She enjoys hiking, camping, and attending concerts no matter where they are at. Jen was previously in the Navy and is now pursuing ultrasonography. She has two beagles she adores named Cooper and Cid. Tonya started working at Phoenix Mountain in August 2018. She worked as a receptionist at an audio and visual company prior and wanted to make the change and work at an animal hospital. 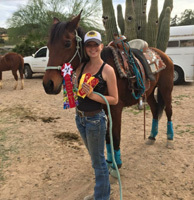 She competes in barrel racing with her horses, Snippy and Pal. She also has a dog named Rico Suave who goes everywhere with her including hiking and camping.